Professionals in education should be aware of instructional practices and interventions that have been shown by research to be most effective. It is crucial for these evidence-based practices to be matched with a student's unique needs and skills when developing interventions and writing goals. Two evidence-based practices that can be found throughout Attainment curricula are a system of Least Intrusive Prompts and the Time-Delay Procedure. 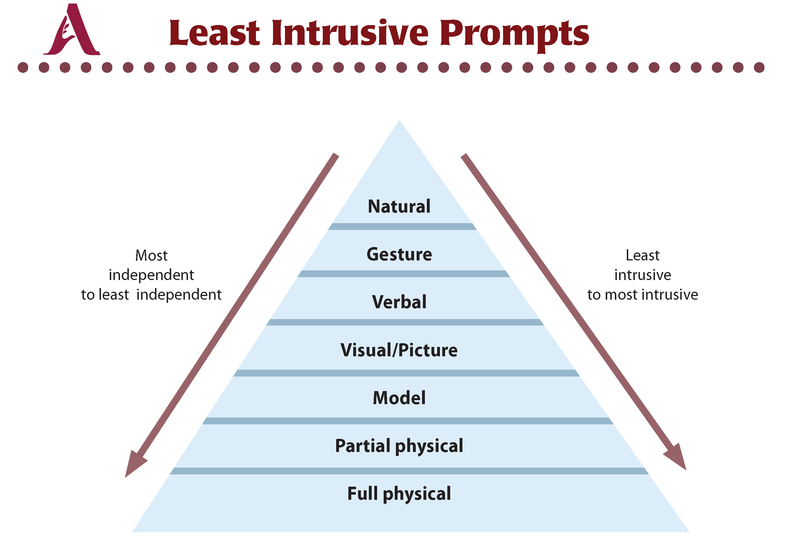 A system of least intrusive prompts, places prompts given to students into a hierarchy from the least intrusive (or most independent) to the most intrusive (or least independent), such as physically guiding the student to respond (e.g., hand over hand). The teacher begins by giving the student a chance to answer independently. If an independent response does not occur, the teacher then provides the least intrusive prompt (e.g., a verbal prompt) to elicit a response. This Least Intrusive Prompt Hierarchy is a visual support to remind you to think about how to prompt students to correct responses without immediately giving the correct answer. Often, we as teachers, are not even aware when or why we are choosing to prompt. This visual can be a great reminder for teachers and staff alike. Consider posting this visual reminder or something similar in your classroom for reference! Remember to individualize prompting for each student by considering how to help them to gain independence in responding over repeated trials. The time-delay procedure is a method of systematic prompting and fading of the prompt using small increments of time. The time-delay procedure is effective with learners of all ages and promotes learning a desired response with fewer or no errors. The teaching of new concepts, vocabulary, and numbers are taught using time-delay as a method of instruction in the Core Curriculum Solution for Elementary. Round 1 is a 0-second time delay for prompting. It is considered a warm-up round. There should be no errors in this round unless the student refuses to respond or cannot initiate a response. Introduce the vocabulary, concept, or number and immediately prompt the correct answer. When the student is comfortable and successful at a 0-second time delay, move on to Round 2. Round 2 provides students with the opportunity to respond independently. In Round 2, give the student up to 5 seconds (or another set time depending on student needs) to respond before giving a prompt. If the student is unsuccessful at a 5-second time delay, return to Round 1 (0-second time delay). The use of evidence-based practices are required by both the IDEA and Elementary and Secondary Education Act (ESEA), but this is not the only reason you should use them. When you use evidence-based practices that match your students’ needs, chances are good that the desired outcomes will be achieved. Most of us became educators to help students succeed, and by using evidence-based practices we can better achieve that goal! If you would like to see evidence-based practices in action, check out the videos below! There is an example of the Time-Delay Procedure and the Least Intrusive Prompt Hierarchy being used with Attainment's elementary and secondary curricular resources.